FINAL ‘Fantastic Beasts: The Crimes of Grindelwald’ Trailer & Shot-By-Shot Breakdown! This final trailer is much more intense and fast-paced that previous trailers, and we’re really getting to see that dark, thriller element coming into the films as promised by David Heyman and David Yates. Better yet, Potter fans FINALLY know the name J.K. Rowling was referring to yesterday – we almost can’t believe it! 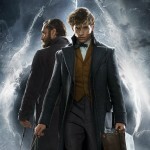 The trailer begins with Dumbledore and Newt in an enclosed space, which looks like a train car. Dumbledore hands Newt a card for a safe house in Paris. 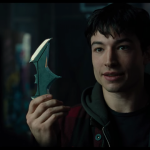 When Leaky asked Ezra Miller if there was anything we should pay special attention to in the trailer, he said to make note of what’s written on that card! It’s hard to make out, but it looks like the alchemist’s mark, indicating Nicolas Flamel, who we know from character profiles has been enlisted by Dumbledore to help Newt in Paris. Newt asks Dumbledore why he’d need a safe house in Paris, and Dumbledore says that should things go horribly wrong, it’d be a nice place to go to “have a cup of tea.” It’s a great scene. We see Grindelwald walking in Paris, holding court in the round stone amphitheatre seen in previous trailers, blue flames appear around the edges of the theater, and we see an explosion in some mountains. 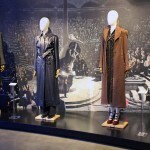 At Grindelwald’s rally – a black cloth covering the buildings of Paris (read more in our set visit report with Martin Foley) – is seen again, hinting at his rise to power. Newt says to Dumbledore “You want me to hunt him down, to kill him. Dumbledore, why can’t you go?”. Here’s the big moment: as Dumbledore says “I can’t move against Grindelwald – it has to be you”, the trailer cuts to a shot of Dumbledore uncovering the Mirror of Erised and seeing a handsome young Grindelwald (Jamie Campbell Bower, from the Harry Potter series! ), who morphs into Johnny Depp’s Grindelwald. Dumbledore is touching the mirror – it’s a very poignant, “lost love” type of scene – you can tell they have history together! We see shots in the French ministry again, then the shots of the Zouwu and Kelpie enclosure in Newt’s basement from the previous trailer. Echoing the scene in the last film where Newt hands Dan a helmet, we meet the wizard and his No-Maj pal on a hillside, where Newt asks Jacob if he gets motion sickness. Jacob says he’s not good on boats, regardless, and Newt appears to pull him into a bucket Portkey. We appear to be inside Flamel’s house in these shots – Tina is there, too! There’s a scene with Newt and the Kelpie – very reminiscent of Harry and Buckbeak – whoops and all! We also see a harrowing shot of some fighter jets – is this a flashback to the war? The line where Newt is told that the time will come when he has to “choose a side” by Theseus from the previous trailer is answered by Newt, with him saying “I don’t do sides”. There’s a shot of most of the Crimes characters, who appear to be on a bridge. Queenie isn’t there, neither is Credence – perhaps they’ve joined Grindelwald, and the rest of the gang are there to get them back? Were you surprised by the big Nagini reveal? Are you tempted to go back through the Potter stories and see how this new character fits into the grand scheme of things in wizarding world history? Us too! Read more about the film in our set reports, and in our coverage of yesterday’s event, and be sure to rewatch the previous trailer from San Diego Comic Con – more exclusive interviews are coming very soon!